As the War Memorial was emptying out and the competitors wound down in the Brehm Pump Up room, the judges went over their scoresheets for the afternoon prejudging at the 2010 Arnold Classic. The top six would be calculated, as well as who sat in what placing heading into the evening’s Finals. Kai Greene came into the show as the defending champion and favorite, but was actually trailing Phil Heath, 10-7. Both men looked good enough to win, but Heath’s conditioning appeared to be a little sharper than Greene’s. As the day turned into night, the winner hung in the balance. There were four men who had a legitimate shot, including Dexter Jackson (16) and Branch Warren (19) also close enough to have something to say. When the six names were announced after the posing routines for all 13 participants concluded, Toney Freeman and Ronny Rockel were also added to the mix. Since the IFBB no longer counts the posing round towards the final scores, the judges may have made up their minds following the pose down. Rockel and Freeman finished sixth and fifth, respectively, and a case could be made that they could have been flip-flopped. The first surprise of the night came when Jackson – in a very important show for him – dropped out of the top three. No argument here, but the fans in attendance let out a collective “oh” when The Blade’s name was called. Then they booed when Warren was next, but this was the proper placing for him. A huge fan favorite, the Texas resident came in looking awesome (particularly his legs) but not better than the two who remained on stage. As Heath’s name was announced by emcee Lonnie Tepper, the audience (or at least a good portion of it) made their feelings known that they disagreed with the decision. That lasted for a short period of time and they gave Greene his due. 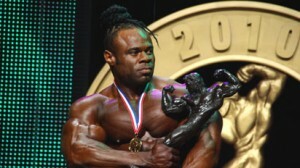 The Brooklyn native became the fourth to win consecutive Arnold Classics, adding his name to a prestigious list that includes Flex Wheeler (1997, 1998), Jay Cutler (2002-2004) and Jackson (2005, 2006). I like Kai more than Phil.